Sign up for Broadjam today to follow Kenny Seymour, and be notified when they upload new stuff or update their news! Introducing "A New Groove" the long awaited release by Kenny Seymour. 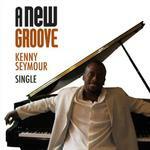 "Kenny is a young, gifted Musician, Producer, Singer, and Songwriter"
Kenny Seymour is always into a new groove and his contributions to the music industry prove itl His career as composer, arranger, producer, pianist spans all mediums that rely on music: Digital Music, Performing Artists, Motion Pictures, Television, Broadway and Off-Broadway Theatre and Commercial Jingles.